The second annual $50,000 Stockton (Calif.) Women's Challenger is scheduled for July 10-17 at the new Eve Zimmerman Tennis Center at the University of the Pacific. The center, which opened March 24, was made possible by a $1.5 million gift from Zimmerman, a former UOP player. The complex features 12 courts and covered player benches, with an electronic scoreboard and a 5,500-square-foot clubhouse on the way. In the singles final of the inaugural Stockton Challenger, fifth-seeded Nao Hibino of Japan beat top-seeded An-Sophie Mestach of Belgium 6-1, 7-6 (6). Hibino, 21, has soared from No. 170 in the world then to No. 71 (second in Japan behind No. 42 Misaki Doi) now. She won her first WTA tour title in Tashkent, Uzbekistan, last fall, although she did not face anyone in the top 100. The 22-year-old Mestach, meanwhile, has plunged from No. 111 to No. 174 (fifth in Belgium). She won the 2011 Australian Open junior girls title and reached No. 1 in the juniors that year. In last year's all-American doubles final, fourth-seeded Jamie Loeb and Sanaz Marand outplayed unseeded Kaitlyn Christian and Danielle Lao 6-3, 6-4. Loeb, the 2015 NCAA singles champion, and Marand starred at North Carolina. Christian, who won the 2013 NCAA doubles title with Sabrina Santamaria, and Lao excelled at USC. Tickets for the Stockton Challenger are available at stocktonchallenger.com. The fifth annual $50,000 FSP Gold River Women's Challenger will be held the following week at the Gold River Racquet Club in the Sacramento area. The reigning champions are Anhelina Kalinina of Ukraine in singles and Americans Ashley Weinhold and Caitlin Whoriskey in doubles. 1. Unseeded Tsvetana Pironkova of Bulgaria stunned No. 2 seed Agnieszka Radwanska 2-6, 6-3, 6-3 in the completion of a suspended match to reach her first French Open quarterfinal. Radwanska led 6-2, 3-0 when play was halted on Sunday night but had trouble controlling the heavy, waterlogged balls in the drizzle. Radwanska, who had surgery on the middle finger of her right (playing) hand at the end of 2009, said she "couldn't really play in that conditions, end of story." But Radwanska, the Wimbledon runner-up to Serena Williams in 2012, proceeded to blast tournament organizers. 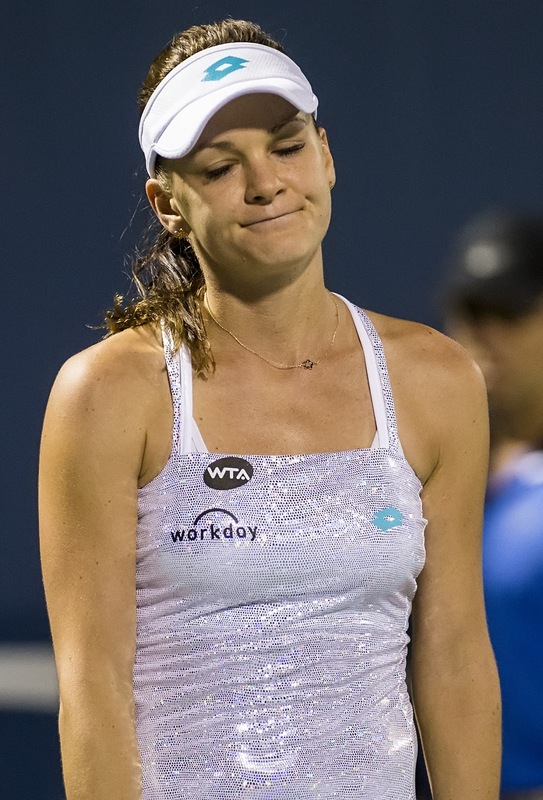 "I'm just so surprised and angry that we have to play in the rain," hissed Radwanska, 27, of Poland. "I mean, it's not a $10,000 tournament; it's a Grand Slam. How can you allow players to play in the rain?" Pironkova, 28, reached the Wimbledon semifinals in 2010 and quarterfinals in 2011. For the first time since such records began in 1983, two women ranked below No. 100 have advanced to the French Open quarterfinals. Pironkova is No. 102, and Shelby Rogers, a 23-year-old American, is No. 108. Their career highs are No. 31 and No. 70, respectively. 2. In the completion of a suspended match between former French Open runners-up, No. 21 seed Samantha Stosur of Australia ousted No. 6 Simona Halep of Romania 7-6 (0), 6-3 to reach her first Grand Slam quarterfinal since the 2012 U.S. Open. Halep, who led 5-3 when play was stopped on Sunday night, also was irate about having to play in the drizzle. "I have no words," she fumed. "It was impossible to play, in my opinion, and to play tennis matches in the rain I think is a bit too much. But everyone was in the same situation, and who was stronger won today." The 32-year-old Stosur, who won the 2011 U.S. Open, lost to Halep 6-2, 6-0 in 51 minutes three weeks ago in the Madrid semifinals. 3. A Serena Williams-Garbine Muguruza final looks increasingly likely. The quarterfinals in the bottom half of the draw are set: No. 4 Muguruza vs. the unseeded Rogers, and Stosur vs. Pironkova. Those matches, as well as the fourth round in the top half, are scheduled for Wednesday. The highest remaining seed in the top half after No. 1 Williams is No. 8 Timea Bacsinszky, a surprise semifinalist last year. Williams, 34, is 3-1 against Muguruza, 22, but in their only meeting on clay, Muguruza dominated 6-2, 6-2 in the second round of the 2014 French Open. 4. After rain wiped out play for the first time in 16 years on Monday at Roland Garros, only a handful of matches were completed today, and light rain is forecast through Friday morning. Saturday's women's final and Sunday's men's final could be pushed back a day or more. 5. No. 1 seed Novak Djokovic leads No. 14 Roberto Bautista Agut of Spain 3-6, 6-4, 4-1 in a fourth-round match halted by rain. Djokovic, 29, is attempting to become the eighth man to earn a career Grand Slam in singles. Patrik Rikl, Czech Republic, def. Sam Riffice, Roseville, Calif., 7-5, 3-6, 6-1. Not only did Mackenzie McDonald lose in the first round of the NCAA Singles Championships last year, he was humiliated. The San Francisco Bay Area resident also lost in the opening round of doubles in 2015. One year later, McDonald became the first man in 15 years to sweep the NCAA titles. The UCLA junior from Piedmont, seeded sixth, outclassed top-seeded Mikael Torpegaard of Ohio State 6-3, 6-3 on Monday in Tulsa, Okla. McDonald and Martin Redlicki, the second seeds in doubles, then beat unseeded Arthur Rinderknech and Jackson Withrow of Texas A&M 6-4, 6-1. "I'm really happy with this accomplishment," said McDonald, who earned singles and doubles wild cards in this year's U.S. Open with the titles. "It's unbelievable. I always wanted to win something for UCLA, and to bring back two trophies for them this year is really cool to me." McDonald, seeded third in NCAA singles last year, lost to Lloyd Glasspool of Texas 6-0, 6-2 in the opening round. Also, McDonald and Redlicki fell to Boris Arias and Jordan Daigle of LSU 4-6, 7-6 (1), 6-4 in a first-round matchup of unseeded teams. 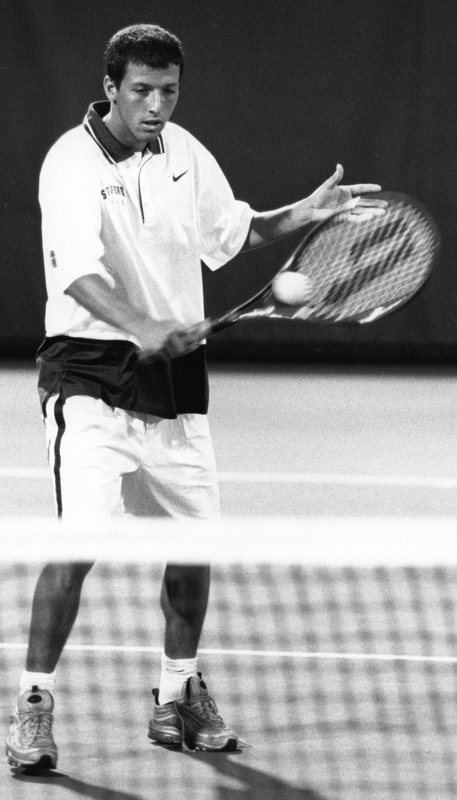 McDonald rebounded to become the first man to sweep the singles and doubles crowns since Mathias Boeker of Georgia in 2001. 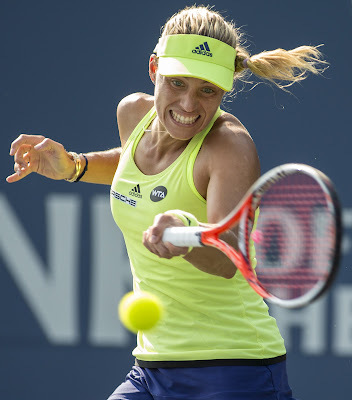 The last woman to accomplish the feat was Nicole Gibbs of Stanford in 2012. Gibbs is now ranked No. 72 in the world in singles. Meanwhile, No. 2 seed Danielle Collins of Virginia beat No. 1 Hayley Carter of North Carolina 6-3, 6-2 for her second NCAA singles title. Collins also won two years ago as a sophomore. No. 3 seeds Brooke Austin and Kourtney Keegan of Florida won the women's doubles title, crushing No. 4 Maegan Manasse and Denise Starr of Cal 6-2, 6-0. Austin reached the singles semifinals in the $50,000 Sacramento Challenger last July. A Cal team lost in the women's doubles final for the second consecutive year. Klara Fabikova and Zsofi Susanyi fell to Maya Jansen and Erin Routliffe of Alabama in 2015. McDonald, only 5-foot-10 (1.78 meters) and 145 pounds (66 kilograms), could forgo his senior season and turn pro. He already is ranked No. 420 in the world under longtime private coach Wayne Ferreira, who reached a career-high No. 6 in 1995. Three years ago, before McDonald had enrolled at UCLA, he became the only unranked teenager to qualify for an ATP World Tour Masters 1000 tournament, the highest level for men besides the Grand Slams. McDonald stunned then-No. 79 Nicolas Mahut of France and then-No. 128 Steve Johnson of Orange in the Los Angeles area to reach the main draw in Cincinnati. Johnson is now ranked No. 34, and Mahut is No. 44. On the U.S. Challenger circuit last fall, McDonald reached the semifinals in Tiburon in the Bay Area, quarterfinals in Sacramento and, as a qualifier, semis in Champaign, Ill. Rain forced the postponement of the entire day's matches in the French Open for the first time in 16 years today. The French Open is the only Grand Slam tournament without a roof over center court. The roof over Arthur Ashe Stadium at the U.S. Open will be completed in time for this year's tournament, Aug. 29-Sept. 11. French Open organizers hope to have a roof over Court Philippe Chatrier by 2020. "I'm coming in front of you tonight just to express my frustration," French Open tournament director Guy Forget said at a news conference. "You suddenly realize that at other places, they would play on center court. You guys (the media) would be working. People that don't have a ticket would probably be watching on screens. "We again have to send the players back and hope that tomorrow play will resume. Once again, I think that having a roof is a necessity. For those in our country who are still doubting the necessity to expand, to modernize our stadium, I think this is proof we have to do it. "We can't be like (this) for many (more) years. And although we have very good hope that it will be done by 2020, I hope no one ... can just stop the process because, once again, it is a necessity." Tuesday's schedule is jammed with matches, but there is a 90 percent chance of rain. The chances are 40 percent on Wednesday and 70 percent on Thursday before falling to 20-30 percent the rest of the week. 1. Roger is absent, but Rogers remains. Roger Federer withdrew before the French Open with back problems. Meanwhile, unseeded Shelby Rogers of Charleston, S.C., reached her first Grand Slam quarterfinal with a 6-3, 6-4 victory over No. 25 seed Irina-Camelia Begu of Romania. The 23-year-old Rogers, ranked No. 108, knocked off a seed for the third time in the tournament. She beat No. 17 Karolina Pliskova in the first round and No. 10 Petra Kvitova, a two-time Wimbledon champion, in the third round. Rogers will meet No. 4 Garbine Muguruza, who eliminated No. 13 Svetland Kuznetsova, the 2009 champion at Roland Garros, 6-3, 6-4 to gain her third consecutive French Open quarterfinal. 2. No. 2 seed Andy Murray ousted the last remaining U.S. man, No. 15 John Isner, 7-6 (9), 6-4, 6-3. The 6-foot-10 (2.08-meter) Isner squandered three set points in the first set. Murray, who defeated 6-foot-11 (2.11-meter) Ivo Karlovic in the third round, will face No. 9 Richard Gasquet of France in a bid for his third straight French Open semifinal and fourth in six years. Gasquet, who will turn 30 on June 18, ousted No. 5 Kei Nishikori 6-4, 2-6, 6-4, 6-2 to reach his first French Open quarterfinal. 3. Unseeded Albert Ramos-Vinolas, a 28-year-old Spaniard left-hander who had won one match in five appearances at Roland Garros, knocked off No. 8 Milos Raonic of Canada 6-2, 6-4, 6-4. Ramos-Vinolas, ranked 55th, will play third seed and defending champion Stan Wawrinka, who wore down 22nd-seeded Viktor Troicki of Serbia 7-6 (5), 6-7 (7), 6-3, 6-2. 4. A pair of unseeded 20-year-old Czechs, Barbora Krejcikova and Katarina Siniakova, stunned top-seeded Martina Hingis and Sania Mirza 6-3, 6-2 to advance to the quarterfinals. Hingis and Mirza had won the last three Grand Slam titles. 5. Unseeded Serena Williams and Venus Williams lost to Kiki Bertens of the Netherlands and Johanna Larsson of Sweden 6-3, 6-3. The Williams sisters had completed a three-set victory over Vitalia Diatchenko of Russia and Galina Voskoboeva of Kazakhstan earlier in the day. Former Stanford stars Bob Bryan and Mike Bryan (5), United States, def. Radek Stepanek, Czech Republic, and Nenad Zimonjic (12), Serbia, 4-6, 7-6 (6), 6-3. CoCo Vandeweghe and ex-Stanford star Bob Bryan (8), United States, def. Chia-Jung Chuang, Taiwan, and Henri Kontinen, Finland, 6-3, 6-3. Torpegaard of Ohio State today in the NCAA singles final. Mackenzie McDonald will have extra incentive in today's NCAA men's singles and doubles finals. NCAA champions from the United States receive a wild card in the U.S. Open, which this year begins Aug. 29. The sixth-seeded McDonald, a UCLA junior from Piedmont in the San Francisco Bay Area, will meet top-seeded Mikael Torpegaard, an Ohio State sophomore from Denmark, today at 10 a.m. PDT in Tulsa, Okla.
Then McDonald and Martin Redlicki, a resident of Boca Raton, Fla., will face unseeded Arthur Rinderknech and Jackson Withrow of Texas A&M at 2 p.m. Rinderknech hails from France, and Withrow is from Omaha, Neb. In the women's doubles semifinals on Sunday, fourth-seeded Maegan Manasse and Denise Starr of Cal edged top-seeded Hayley Carter and Whitney Kay of North Carolina 6-4, 4-6 [10-7]. Manasse and Starr will play third-seeded Brooke Austin and Kourtney Keegan of Florida for the title today at noon. Today's matches will be streamed live at tulsahurricane.com. McDonald, only 5-foot-10 (1.78 meters) and 145 pounds (66 kilograms), downed No. 9-16 seed Joao Monteiro of Virginia Tech 6-2, 3-6, 6-3. It was the fourth straight three-set match for Monteiro, a senior from Portugal, and the first of the tournament for McDonald. The match was moved indoors after the first set because of lightning in the area, and McDonald trailed 2-0 in the third set. Torpegaard, 6-foot-4 (1.93 meters), outclassed fifth-seeded Cameron Norrie of Texas Christian 6-3, 6-4. Mikael Torpegaard (1), Ohio State, def. Cameron Norrie (5), Texas Christian, 6-3, 6-4. Mackenzie McDonald (6), UCLA, def. Joao Monteiro (9-16), Virginia Tech, 6-2, 3-6, 6-3. Arthur Rinderknech and Jackson Withrow, Texas A&M, def. David Biosca and Rogerio Ribeiro, East Tennessee State, 6-2, 5-7 [10-7]. Mackenzie McDonald and Martin Redlicki (2), UCLA, def. Alex Lawson and Quentin Monaghan, Notre Dame, 7-5, 6-7 (5) [10-8]. Hayley Carter (1), North Carolina, def. Sinead Lohan (8), Miami, 1-6, 7-5, 6-2. Danielle Collins (2), Virginia, def. Luisa Stefani (7), Pepperdine, 7-6 (7), 6-4. Maegan Manasse and Denise Starr (4), Cal, def. Hayley Carter and Whitney Kay (1), North Carolina, 6-4, 4-6 [10-7]. Brooke Austin and Kourtney Keegan (3), Florida, def. Catherine Harrison and Kyle McPhillips (5-8), UCLA, 4-6, 6-3 [10-5]. 1. No. 6 seed Jo-Wilfried Tsonga, bidding to become the first Frenchman to win Roland Garros since Yannick Noah 33 years ago, retired with a thigh injury while leading Ernests Gulbis of Latvia 5-2 in the third round. Tsonga, who had reached the French Open semifinals in two of the past three years, withdrew from the Italian Open earlier this month with the same problem. 2. Top seeds Novak Djokovic and Serena Williams advanced in straight sets, although Williams struggled. Djokovic, attempting to become the eighth man to achieve a career Grand Slam, outclassed Aljaz Bedene of Great Britain 6-2, 6-3, 6-3. Williams, trying to tie Steffi Graf for second place with 22 Grand Slam singles titles, subdued No. 26 seed Kristina Mladenovic of France 6-4, 7-6 (10). 3. No. 18 seed Elina Svitolina of Ukraine eliminated No. 14 Ana Ivanovic, a former French Open champion and a semifinalist last year, 6-4, 6-4. The 21-year-old Svitolina, a semifinalist in the Bank of the West Classic at Stanford last August, will face Williams, a three-time Bank of the West champion, in the round of 16. Ivanovic won the 2008 French Open to climb to No. 1 in the world. She also reached the 2007 final at Roland Garros, losing to Justine Henin. 4. Four American women and one U.S. man have reached the singles round of 16. Remaining alive on the women's side, in addition to Serena Williams, are No. 9 seed Venus Williams, No. 15 Madison Keys and unseeded Shelby Rogers. On the men's side, No. 15 John Isner has matched his career-best result at Roland Garros. The 6-foot-10 (2.08-meter) Isner is scheduled to play No. 2 Andy Murray today. Murray leads the head-to-head series 5-0. 5. All teenagers have been eliminated in men's and women's singles. Losing in the third round on Saturday were 19-year-olds Alexander Zverev of Germany, Borna Coric of Croatia and Daria Kasatkina, seeded 29th, of Russia. Naomi Osaka, 18, of Japan lost in the third round on Friday. The 6-foot-6 (1.98-meter) Zverev is widely considered a future world No. 1. Lukasz Kubot, Poland, and Alexander Peya (9), Austria, def. Eric Butorac and former Stanford star Scott Lipsky, United States, 5-7, 6-2 7-6 (4). While Mackenzie McDonald breezes through the NCAA men's singles draw, Joao Monteiro barely survives. No. 6 seed McDonald of UCLA via Piedmont in the San Francisco Bay Area and No. 9-16 Monteiro of Virginia Tech will meet in the semifinals on Sunday at noon PDT in Tulsa, Okla. The match will be streamed live at tulsahurricane.com. No. 1 Mikael Torpegaard of Ohio State will face No. 5 Cameron Norrie of Texas Christian in the other semifinal, also at noon. McDonald, 5-foot-10 (1.78 meters), is the only American men's semifinalist. Monteiro is a 5-foot-10 senior from Portugal, Torpegaard a 6-foot-4 (1.93-meter) sophomore from Denmark and Norrie a 6-foot (1.82-meter) sophomore from New Zealand. McDonald, ranked No. 420 in the world and privately coached by former top-10 player Wayne Ferreira, outclassed No. 2 seed Roberto Cid of South Florida 6-3, 6-2 today. Monteiro edged No. 4 seed Aleks Vukic of Illinois 6-3, 5-7, 7-6 (3) for his third straight three-set victory. Monteiro ousted the defending champion, No. 8 seed Ryan Shane of two-time reigning NCAA champion Virginia, in the round of 16. McDonald also reached the doubles semifinals with Martin Redlicki. The second seeds will meet unseeded Alex Lawson and Quentin Monaghan of Notre Dame. They ousted No. 5-8 seeds Filip Bergevi and Florian Lakat of Cal, 6-3, 7-5. In the women's doubles quarterfinals, No. 4 seeds Maegan Manasse and Denise Starr beat unseeded sisters Mayar Sherif Ahmed and Rana Sherif Ahmed of Fresno State 6-1, 7-5. Manasse and Starr will play No. 1 seeds Hayley Carter and Whitney Kay, a North Carolina pair who routed unseeded Bay Area residents Hadley Berg and Paige Cline of South Carolina 6-1, 6-2. 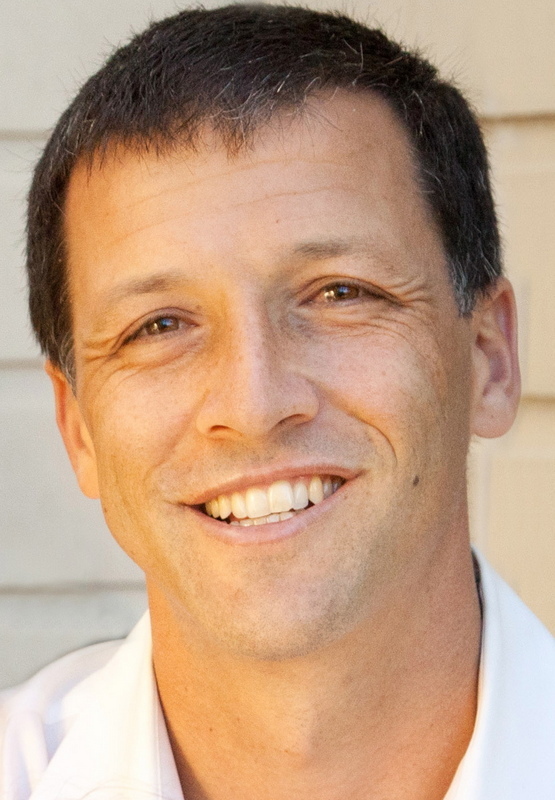 Berg is from Greenbrae and Cline from Kentfield. Both suburbs are situated in Marin County across the Golden Gate Bridge from San Francisco. Mikael Torpegaard (1), Ohio State, def. Petros Chrysochos, Wake Forest, 6-3, 6-0. Cameron Norrie (5), Texas Christian, def. Thai-Son Kwiatkowski (9-16), Virginia, 4-6, 6-2, 6-1. Joao Monteiro (9-16), Virginia Tech, def. Aleks Vukic (4), Illinois, 6-3, 5-7, 7-6 (3). Mackenzie McDonald (6), UCLA, def. Roberto Cid (2), South Florida, 6-3, 6-2. David Biosca and Rogerio Ribeiro, East Tennessee State, def. Jack Murray and Brayden Schnur, North Carolina, 6-2, 7-6 (7). Arthur Rinderknech and Jackson Withrow, Texas A&M, Skander Mansouri and Christian Seraphim, Wake Forest, 3-6, 6-3 [10-6]. Alex Lawson and Quentin Monaghan, Notre Dame, def. Filip Bergevi and Florian Lakat (5-8), Cal, 6-3, 7-5. Mackenzie McDonald and Martin Redlicki (2), UCLA, def. Julian Cash and Arjun Kadhe, Oklahoma State, 7-6 (4), 7-5. Hayley Carter (1), North Carolina, def. Katarina Adamovic, Oklahoma State, 4-6, 6-0, 6-1. Sinead Lohan (8), Miami, def. Breaunna Addison (9-16), Texas, 6-2, 6-4. Luisa Stefani (7), Pepperdine, def. Kennedy Shaffer, Georgia, 6-1, 6-4. Danielle Collins (2), Virginia, def. Jasmine Lee (9-16), Mississippi State, 7-5, 6-3. Hayley Carter and Whitney Kay (1), North Carolina, def. Hadley Berg and Paige Cline, South Carolina, 6-1, 6-2. Maegan Manasse and Denise Starr (4), Cal, def. Mayar Sherif Ahmed and Rana Sherif Ahmed, Fresno State, 6-1, 7-5. Brooke Austin and Kourtney Keegan (3), Florida, def. Alexandra Osborne and Ebony Panoho, Arizona State, 6-4, 6-1. Catherine Harrison and Kyle McPhillips (5-8), UCLA, def. Mami Adachi and Aldila Sutjiadi (2), Kentucky, 6-0, 6-2. The similarities between Mackenzie McDonald and Maegan Manasse are almost eerie. Both are college juniors with strong Northern California ties. Both are seeded sixth in the NCAA Singles Championships. Both played No. 9-16 seeds in the round of 16 on Friday. Both reached the NCAA doubles quarterfinals. And both have first and last names that start with "M."
But McDonald and Manasse met different fates in singles in Tulsa, Okla.
McDonald, from UCLA via Piedmont, Calif., in the San Francisco Bay Area, routed Skander Mansouri of Wake Forest 6-1, 6-2 to reach the quarterfinals for the second time. “I came out knowing what I needed to do today and took care of business," said McDonald, who's ranked No. 420 in the world and privately coached by former top-10 player Wayne Ferreira. "I just took it to the guy. I played really well. I moved my feet really well today, took away time, and there wasn't much he could do." Manasse, from Cal and Redondo Beach in the Los Angeles area, lost to Jasmine Lee of Mississippi State 6-4, 7-6 (0). McDonald, only 5-foot-10 (1.78 meters) and 145 pounds (66 kilograms), has surrendered just 10 games in three straight-set victories. He is scheduled to face second-seeded Roberto Cid of South Florida today at 11 a.m. PDT (live streaming at tulsahurricane.com). Virginia senior Ryan Shane, the eighth seed and defending champion in singles, lost to 9-16 seed Joao Monteiro of Virginia Tech 1-6, 7-5, 6-2. Virginia won its second straight NCAA team title on Tuesday. In women's doubles, No. 4 seeds Manasse and Denise Starr will meet unseeded sisters Mayar Sherif Ahmed and Rana Sherif Ahmed of Fresno State at 10 a.m.
--Bay Area residents Hadley Berg and Paige Cline of South Carolina in the women's draw. Berg is from Greenbrae and Cline from Kentfield. Unseeded, they will take on top-seeded Hayley Carter and Whitney Kay of North Carolina. --No. 5-8 men's seeds Filip Bergevi and Florian Lakat of Cal. Mackenzie McDonald (6), UCLA, def. Skander Mansouri (9-16), Wake Forest, 6-1, 6-2. Filip Bergevi and Florian Lakat (5-8), Cal, def. Henry Craig and Alex Gasson, Denver, 6-4, 2-6 [13-11]. Mackenzie McDonald and Martin Redlicki (2), UCLA, def. Jack Schipanski and Luis Valero, Tennessee, 6-3, 6-3. Jasmine Lee (9-16), Mississippi State, def. Maegan Manasse (6), Cal, 6-4, 7-6 (0). Hadley Berg and Paige Cline, South Carolina, def. Pleun Burgmans and Alizee Michaud, Auburn, 6-0, 6-4. Maegan Manasse and Denise Starr (4), Cal, def. Apichaya Runglerdkriangkrai and Luisa Stefani, Pepperdine, 2-6, 6-4 [10-6]. Mayar Sherif Ahmed and Rana Sherif Ahmed, Fresno State, def. Danielle Collins and Meghan Kelley, Virginia, 6-4, 6-2. 1. Novak Djokovic's bid to become the eighth man to achieve a career Grand Slam in singles is looking better all the time. Nine-time champion Rafael Nadal withdrew because of a left wrist injury. He was scheduled to play fellow Spaniard Marcel Granollers in the third round. "I have to retire from the tournament because of a problem in my wrist that I have had for a couple of weeks," the left-hander, who will turn 30 next Friday, said at a news conference. "Yesterday I played with an injection in my wrist. Last night I started to feel more and more pain. I did an MRI and an echography, and the results were not positive. It's not broken, but if I keep playing, something will break in the next couple of days. Every day the image as gotten a bit worse. "I came here to win the tournament, and that means playing five more matches. Accoring to the doctor, that would be impossible, as there is a 100 percent chance something will break. I know that I cannot finish the tournament. It's part of life, and I hope to be back at Roland Garros for many years to come." Nadal lost only nine games in his two matches (six sets). Tied for second place with 14 Grand Slam singles titles, he has not won one since the 2014 French Open. Roger Federer withdrew before the French Open, saying he was not 100 percent. The 2009 champion at Roland Garros underwent knee surgery on Feb. 3 and pulled out of Madrid this month because of a recurring back problem. 2. No. 21 seed Samantha Stosur ousted No. 11 Lucie Safarova, last year's runner-up to Serena Williams and doubles champion with Bethanie Mattek-Sands, 6-3, 6-7 (0), 7-5 in the third round. Safarova, a 29-year-old left-hander, has been plagued by injury and illness since last summer. She has suffered an abdominal strain, a bacterial illness, a wrist injury and, after winning the Prague title in her native Czech Republic in late April, food poisoning. Stosur, a 32-year-old Australian, won the 2011 U.S. Open and reached the final of the 2010 French Open. 3. Unseeded Shelby Rogers of Charleston, S.C., toppled No. 10 Petra Kvitova, a two-time Wimbledon champion, 6-0, 6-7 (3), 6-0 to reach the fourth round of a Slam for the first time. The 23-year-old Rogers, ranked No. 108, will face No. 25 Irina-Camelia Begu of Romania. 4. No. 3 Stan Wawrinka, the defending champion, defeated No. 30 Jeremy Chardy of France 6-4, 6-3, 7-5. Wawrinka will play No. 22 Viktor Troicki of Serbia in the round of 16. Troicki eliminated No. 16 Gilles Simon of France 6-4, 6-2, 6-2. 5. No. 2 seeds Andy Murray and Agnieszka Radwanska advanced in consecutive matches on Court Suzanne-Lenglen. Murray will face No. 15 John Isner, and Radwanska will meet unseeded Tsvetana Pironkova of Bulgaria. Former Stanford stars Bob Bryan and Mike Bryan (5), United States, def. Oliver Marach, Austria, and Fabrice Martin, France, 6-3, 7-6 (1). Aleksandra Krunic, Serbia, and Mirjana Lucic-Baroni, Croatia, def. San Jose resident and former Cal star Raquel (Kops-Jones) Atawo and Abigail Spears (8), United States, 7-6 (6), 6-3. CoCo Vandeweghe and former Stanford star Bob Bryan (8), United States, def. Virginie Razzano and Vincent Millot, France, 6-3, 7-5. Jelena Jankovic and Nenad Zimonjic, Serbia, def. San Jose resident and former Cal star Raquel (Kops-Jones) Atawo and Raven Klaasen, South Africa, 7-6 (5), 6-4. Gustav Hansson, Mississippi, def. Tom Fawcett (9-16), Stanford, 6-3, 2-6, 6-4. Mackenzie McDonald (6), UCLA/Piedmont, Calif., def. Quentin Monaghan, Notre Dame, 6-4, 6-1. Diego Hidalgo and Gordon Watson (1), Florida, def. Tom Fawcett and Maciek Romanowicz, Stanford, 6-3, 3-6 [10-7]. Herkko Pollanen and Mikael Torpegaard, Ohio State, def. Rhys Johnson and Cameron Klinger of San Jose (5-8), Vanderbilt/Klinger from San Jose, Calif., 6-3, 4-6 [11-9]. Boris Arias and Jordan Daigle (5-8), LSU, def. Shawn Hadavi and Richard Pham, Columbia/Pham from Saratoga, Calif., 6-3, 6-2. Filip Bergevi and Florian Lakat (5-8), Cal, def. Alex Alvaro and Ramon van Flymen, Eastern Kentucky, 6-4, 6-4. Mackenzie McDonald and Martin Redlicki (2), UCLA/McDonald from Piedmont, Calif., def. Thai-Son Kwiatkowski and Mac Styslinger, Virginia, 6-2, 7-6 (3). Desirae Krawczyk, Arizona State, def. Klara Fabikova (9-16), Cal, 6-3, 7-6 (5). Maegan Manasse (6), Cal, def. Yuliya Lysa, Arkansas, 7-6 (6), 6-1. Hadley Berg and Paige Cline, South Carolina/Berg from Greenbrae, Calif., and Cline from Kentfield, Calif., def. Miho Kowase and Anna Sanford, Ohio State, 6-4, 1-6 [10-5]. Maegan Manasse and Denise Starr (4), Cal, def. Mai El Kamash and Arianne Hartono, Mississippi, 2-6, 6-1 [10-8]. Mayar Sherif Ahmed and Rana Sherif Ahmed, Fresno State, def. Taylor Davidson and Caroline Doyle (5-8), Stanford/Doyle from San Francisco, 6-2, 7-6 (0). Breaunna Addison and Danielle Wagland, Texas, def. Giuliana Olmos and Gabby Smith (5-8), USC/Olmos from Fremont, Calif., 6-4, 6-1. Mami Adachi and Aldila Sutjiadi (2), Kentucky, def. Melissa Lord and Carol Zhao, Stanford, 2-6, 6-2 [11-9]. 1. Alize Cornet of France overcame leg cramps to defeat Tatjana Maria of Germany 6-3, 6-7 (5), 6-4 in the second round, and each player accused the other of poor sportsmanship afterward. Cornet, the 2007 French Open junior girls champion who stunned Serena Williams in the third round at Wimbledon two years ago, repeatedly received treatment during changeovers in the third set. After winning, Cornet fell on her back in celebration. Maria, instead of waiting at the net, shook hands with the chair umpire and put her racket in her back before walking to the net near the chair to shake hands with Cornet. Maria then scolded Cornet while wagging a finger at her as the partisan crowd booed. "It's not fair play, what she did ... she had cramps," said the 28-year-old Maria, one of the few mothers on the WTA tour. "She takes physio for her left leg because her right leg was cramping." Said Cornet, 26: "She told me I was unfair. But it is she who was unfair, asking the umpire to give me time warnings." Cornet and Maria are scheduled to meet again in the second round of women's doubles on Friday. 2. Top-seeded Novak Djokovic and fourth-seeded Rafael Nadal advanced in straight sets. Nadal has lost only nine games in two matches (six sets). Djokovic is attempting to become the eighth man to achieve a career Grand Slam in singles. Nadal is trying to become the first player in the Open era, which began in 1968, to win 10 singles titles in a Grand Slam tournament. 3. Sixth-seeded Jo-Wilfried Tsonga, bidding to become the first Frenchman to win Roland Garros since Yannick Noah 33 years ago, avoided elimination with a 6-7 (6), 3-6, 6-3, 6-2, 6-2 victory over Marcos Baghdatis of Cyprus. 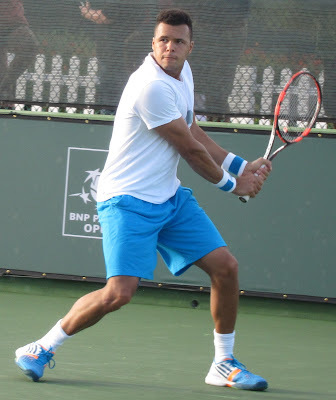 Tsonga, 31, and Baghdatis, who will turn 31 on June 17, were born exactly two months apart. Also, each has lost in the Australian Open in his only Grand Slam final. Tsonga fell to Djokovic in 2008 and Baghdatis to Roger Federer in 2006. The primary difference between the two is size: Tsonga is 6-foot-2 (1.88 meters) and 200 pounds (91 kilograms), and Baghdatis is 5-foot-10 (1.78 meters) and 181 pounds (82 kilograms). Baghdatis won the 2014 Comerica Bank Challenger in Aptos, Calif.
4. No. 1 seed Serena Williams and No. 9 Venus Williams advanced with 6-2, 6-1 victories. Serena overwhelmed Teliana Pereira of Brazil, and Venus routed 20-year-old qualifier Louisa Chirico in an all-American matchup. 5. Four teenagers have reached the third round: 18-year-old Naomi Osaka of Japan and 19-year-old Daria Kasatkina of Russia on the women's side, and 19-year-olds Borna Coric of Croatia and Alexander Zverev of Germany in the men's draw. In Osaka's main-draw debut on the WTA tour at 16, she stunned 2011 U.S. Open champion Samantha Stosur 4-6, 7-6 (7), 7-5 in the first round of the 2014 Bank of the West Classic at Stanford. 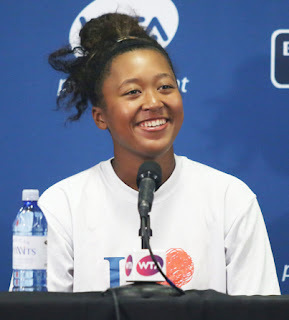 The 5-foot-11 (1.80-meter) Osaka, who has a Haitian father and Japanese mother, survived a match point at 6-7 in the tiebreaker and overcame a 3-5 deficit in the third set. Osaka next will meet sixth-seeded Simona Halep, the 2014 runner-up to Maria Sharapova at Roland Garros. Bob Bryan and Mike Bryan (5), former Stanford All-Americans from the United States, def. Mariusz Fyrstenberg, Poland, and Santiago Gonzalez, Mexico, 6-2, 6-3. Eric Butorac, United States, and Scott Lipsky, former Stanford All-American from the United States, def. Raven Klaasen, South Africa, and Rajeev Ram (8), United States, 3-6, 6-3, 7-6 (2). Sabine Lisicki and Andrea Petkovic, Germany, def. Nicole Gibbs, former Stanford All-American from the United States, and Heather Watson, Great Britain, 6-4, 6-4. Andrea Hlavackova, Czech Republic, and Edouard Roger-Vasselin (6), France, def. Anabel Medina-Garrigues, Spain, and Scott Lipsky, former Stanford All-American from the United States, 6-2, 6-2. 1. Second-seeded Andy Murray survived a five-setter for the second straight match, beating 22-year-old French wild card Mathias Bourgue 6-2, 2-6, 4-6, 6-2, 6-3 in the second round. "He was excellent," Murray said after the 3-hour, 34-minute match. "He was the one dictating a lot of the points, making me run a lot right to the end, even when I had a big lead in the fifth set. He's going to have a fantastic future for sure." Murray won the first of his 36 tour-level titles in the now-defunct SAP Open in San Jose at 18 in 2006 and repeated in 2007. Those were his only appearances in the tournament. 2. Ivo Karlovic, 37, of Croatia became the oldest man to reach the third round of a Grand Slam tournament since Jimmy Connors advanced to the U.S. Open semifinals 25 years ago. The 6-foot-11 (2.11-meter) Karlovic, seeded 27th, edged wild card Jordan Thompson of Australia 6-7 (2), 6-3, 7-6 (3), 6-7 (4), 12-10 in 4 hours, 31 minutes. Karlovic will face Murray in the third round. If Karlovic pulls off an upset, he could play 6-foot-10 (2.08-meter) John Isner, seeded 15th, in the round of 16. Karlovic leads Isner 3-2 in the head-to-head series, winning the last meeting 7-6 (4), 7-6 (5) in the first round on a hardcourt in Acapulco in 2014. 3. Gilles Simon's victory lasted one more minute than Karlovic's. Simon, a Frenchman seeded 16th, needed seven match points to outlast Guido Pella of Argentina 4-6, 1-6, 7-5, 7-6 (4), 6-4. Pella, a 26-year-old left-hander, served for the match at 6-5 in the fourth set. 4. Speaking of marathons, 25th-seeded Irina-Camelia Begu of Romania topped CoCo Vandeweghe of the United States 6-7 (4), 7-6 (4), 10-8 in 3 hours, 38 minutes. It was the longest WTA match this year. Vandeweghe reached the final of the 2012 Bank of the West Classic at Stanford as a lucky loser, falling to Serena Williams 7-5, 6-3. Vandeweghe held a set point in the first set. 5. Third-seeded Stan Wawrinka, the defending champion, and second-seeded Agnieszka Radwanska won in straight sets. Brian Baker, United States, and Marcus Daniell, New Zealand, def. Marcos Baghdatis, Cyprus, and Dmitry Tursunov, Russia native who trains in Sacramento suburb of Granite Bay, 6-3, 6-2. Raquel Atawo, San Jose resident and 2003 NCAA doubles champion from Cal, and Abigail Spears (8), United States, def. Johanna Konta, Great Britain, and Maria Sanchez, born and raised in Modesto, 6-7 (3), 6-4, 6-4. Tom Fawcett (9-16), Stanford, def. Nicolas Alvarez, Duke, 6-2, 6-3. Sam Shropshire, Northwestern, def. Alec Adamson, UC Davis, 7-6 (5), 4-6, 7-5. Mackenzie McDonald (6), UCLA junior from Piedmont in San Francisco Bay Area, def. Ryotaro Matsamura, Kentucky, 6-0, 6-2. Ryan Shane (8), defending champion from Virginia, def. Andre Goransson, Cal, 6-2, 7-6 (0). Gabriel Friedrich, South Carolina, def. Florian Lakat, Cal, 2-6, 6-1, 7-6 (4). William Bushamuka, Kentucky, def. Collin Altamirano, Virginia sophomore from Sacramento, 6-4, 6-4. Maegan Manasse (6), Cal, def. Caroline Brinson, Georgia, 6-3, 6-2. Jessica Golovin, LSU, def. Mayar Sherif Ahmed, Fresno State, 6-4, 7-6 (4). Breaunna Addison (9-16), Texas, def. Giuliana Olmos, USC senior from Fremont in San Francisco Bay Area, 6-4, 6-0. Klara Fabikova (9-16), Cal, def. Beatriz Machado Santos, Missouri, 6-3, 2-6, 6-3. They faced the nation's top-ranked team, the NCAA defending champion and the "home" team. Four of their six dual matches came down to the last encounter. And they trailed 3-1 in the final. The Stanford women overcame all of it to win their 18th NCAA team title. Taylor Davidson won the deciding match for the third time in this year's NCAA Championships, giving the Cardinal a 4-3 victory over 12th-seeded Oklahoma State today in Tulsa, Okla.
"My dreams just became reality," the 46th-ranked Davidson, a junior from Statesville, N.C., tweeted after vanquishing No. 44 Vladica Babic 3-6, 7-5, 7-5 on Court 2. "We are the 2016 NATIONAL CHAMPIONS!!!! Nothing compares to this feeling. Nothing. Number 15? No. Number 1." About 700 fans made the one-hour drive from Stillwater, Okla., where Oklahoma State is located, to cheer on the Cowgirls (29-5). With Oklahoma State leading 3-1, Stanford freshmen Caroline Lampl and Melissa Lord won on Court 5 and 6, respectively, after losing the first set. Stanford (20-5) beat Florida, ranked first but seeded second, 4-3 in the round of 16 and sixth-ranked Vanderbilt, the defending champion, 4-2 in the semifinals. The Cardinal leads all schools with its 18 NCAA team titles. Florida is next with six. The NCAA Men's and Women's Singles and Doubles Championships begin Wednesday in Tulsa. Men's final -- In a virtual replay of last year's final, top-ranked Virginia defeated No. 11 Oklahoma 4-1. The Cavaliers defeated the Sooners 4-2 for the 2015 title in Waco, Texas. Virginia (30-4) won its third NCAA team title in four years and appeared in the final for the fifth time in six years. Oklahoma (20-11) still seeks its first NCAA title after losing in the final for the past three years. Henrik Wiersholm, a sophomore from Kirkland, Wash., won the clinching match on Court 6. No. 33 Collin Altamirano, a Virginia sophomore from Sacramento, Calif., trailed No. 25 Axel Alvarez Llamas 7-5, 4-3 on Court 2 when their match was abandoned. Altamirano won at No. 3 doubles to help the Cavaliers win the doubles point. Oklahoma is coached by John Roddick, the older brother of former world No. 1 Andy Roddick. ITA awards -- Cal's Amanda Augustus was named the Intercollegiate Tennis Association Women's Coach of the Year. The Bears won their first National Women's Team Indoor championship and opened the dual-match season with a school-record 19 consecutive victories. Ranked No. 1 for most of the season, Cal was seeded first in the NCAA Championships and reached the semifinals before falling to Oklahoma State. The Bears finished 23-2. Sem Verbeek, a senior on the Pacific men's team, received the Rafael Osuna Sportsmanship Award. 1. No. 43 Maria Alvarez and Kelsey Laurente (OSU) def. No. 5 Taylor Davidson and Caroline Doyle, 6-3. 2. No. 54 Viktoriya Lushkova and Carla Tur Mari (OSU) def. No. 31 Melissa Lord and Carol Zhao, 5-5, suspended. 3. No. 79 Katarina Adamovic and Vladica Babic (OSU) def. Krista Hardebeck and Caroline Lampl, 6-1. 1. No. 47 Katarina Adamovic (OSU) def. No. 25 Carol Zhao, 6-4, 7-5. 2. No. 46 Taylor Davidson (STAN) def. No. 44 Vladica Babic, 3-6, 7-5, 7-5. 3. No. 66 Viktoriya Lushkova (OSU) def. No. 67 Caroline Doyle, 4-6, 6-4, 6-1. 4. No. 100 Krista Hardebeck (STAN) def. Kelsey Laurente, 6-4, 6-4. 5. Caroline Lampl (STAN) def. Katarina Stresnakova, 4-6, 6-3, 6-3. 6. Melissa Lord (STAN) def. Carla Tur Mari, 6-7 (6), 6-2, 6-2. 1. No. 4 Luca Corinteli and Ryan Shane (VA) def. No. 24 Axel Alvarez Llamas and Andrew Harris, 7-5. 2. Alex Ghilea and Spencer Papa (OKLA) def. No. 16 Thai-Son Kwiatkowski and Mac Styslinger, 7-5. 3. J.C. Aragone and Collin Altamirano (VA) def. Andre Biro and Austin Siegel, 6-1. 1. No. 97 Andrew Harris (OKLA) def. No. 8 Ryan Shane, 7-6 (3), 6-0. 2. No. 25 Axel Alvarez Llamas (OKLA) led No. 33 Collin Altamirano, 7-5, 4-3, unfinished. 3. No. 9 Thai-Son Kwiatkowski (VA) def. No. 82 Spencer Papa, 6-4, 6-4. 4. No. 78 Alexander Ritschard (VA) led No. 61 Alex Ghilea, 6-1, 1-6, 5-2, unfinished. 5. No. 110 J.C. Aragone (VA) def. Florin Bragusi, 6-3, 6-4. 6. Henrik Wiersholm (VA) def. Andre Biro, 6-2, 7-6 (2). French Open Day 3 highlights: Kerber ousted, etc. 1. Kiki Bertens of the Netherlands upset third-seeded Angelique Kerber of Germany 6-2, 3-6, 6-3 in the first round. In retrospect, it's not terribly surprising. Whereas Bertens swept the clay-court Nuremberg titles last week (qualifying in singles), Kerber was coming off two first-round losses on clay. Kerber won the Bank of the West Classic at Stanford last August and stunned Serena Williams in the Australian Open in January for her first Grand Slam title at age 28. Although Kerber has had some good results since Melbourne, it's natural to suffer a letdown after achieving a lifetime goal. In such cases, it often takes a year or more to regain intensity. 2. Fifth-seeded Victoria Azarenka of Belarus retired with a right knee injury with Karin Knapp of Italy leading 6-3, 6-7 (6), 4-0. This, too, was less than shocking. Azarenka, the Bank of the West Champion in 2010, has battled injuries since winning the Australian Open in 2012 and 2013. She recovered to win Indian Wells and Miami back-to-back on hardcourts in March and April, but the grind took a toll. Azarenka withdrew from her third-round match in Madrid on clay earlier this month with a back injury and lost meekly in her Rome opener the following week. 3. Second-seeded Andy Murray of Great Britain completed a 3-6, 3-6, 6-0, 6-3, 7-5 victory over 37-year-old qualifier Radek Stepanek of the Czech Republic. The match was halted by darkness on Monday with Murray leading 4-2 in the fourth set. Murray and Stepanek won three titles combined in the now-defunct SAP Open in San Jose, Calif. Murray captured the first of his 36 tour-level championships there at 18 in 2006 and repeated in 2007 in his only two appearances in the tournament. Stepanek triumphed in 2009 and reached a career-high No. 4 in 2012. 4. Top seeds Novak Djokovic and Serena Williams and fourth-seeded Rafael Nadal won easily. Djokovic, attempting to become the eighth man to earn a career Grand Slam, dismantled Yen-Hsun Lu of Taiwan 6-4, 6-1, 6-1. Williams, trying to tie Steffi Graf for second place all-time with 22 major singles titles, demolished Magdalena Rybarikova of Slovakia 6-2, 6-0 in 44 minutes. Williams won the Bank of the West in 2011, 2012 and 2014. Nadal, seeking to become the first player in the Open era (since 1968) to win 10 singles titles in a Grand Slam tournament, dismissed Australian Sam Groth 6-1, 6-1, 6-1 in 80 minutes. Groth is credited with the world's fastest serve, 163.7 mph (263.4 kph) in the 2012 Busan (South Korea) Challenger. 5. Dmitry Tursunov, a 33-year-old Russian who trains in the Sacramento suburb of Granite Bay, lost to 14th-seeded Roberto Bautista Agut of Spain 6-3, 6-3, 6-1. The injury-prone Tursunov, who reached a career-high No. 20 in 2006, hadn't played a match since mid-April or won one since mid-March. His manager, Michael Gorin, wrote in an e-mail last week that "Dmitry is not at 100 percent" but would not elaborate. A San Francisco Bay Area school will play for the NCAA Division I women's team title, but not the one most people expected. Stanford, ranked and seeded 15th, surprised sixth-ranked Vanderbilt, the defending champion, 4-2, on Monday in Tulsa, Okla. Cal, ranked second but seeded first, lost to 12th-ranked Oklahoma State 4-3. Freshman Caroline Lampl clinched Stanford's victory for a team-high seventh time, outlasting Fernanda Contreras 6-4, 6-7 (4), 6-3 on Court 5. Cal's Lynn Chi, ranked 80th, fell to Viktoriya Lushkova, ranked 66th, 2-6, 6-4, 6-2 in the deciding match on Court 2. Chi, the NCAA runner-up as a sophomore in 2014, ended her Cal career. She was not selected for the NCAA singles or doubles tournaments, which start on Wednesday. About 600 fans made the one-hour drive from Stillwater, Okla., where Oklahoma State is located, to Tulsa to cheer on the Cowgirls (29-4). Cal finished the season at 23-2. Today's final is scheduled for 10 a.m. PDT (live streaming at ncaa.com). Stanford (19-5) has won a record 17 NCAA women's team titles, most recently in 2013. Florida is second with six. Oklahoma State (29-4) will take an 18-match winning streak into its first NCAA final. Today's 4 p.m. men's final (live streaming at ncaa.com) between top-ranked Virginia (29-4) and No. 11 Oklahoma (20-10) will be a rematch of last year's title contest, which the Cavaliers won 4-1 in Waco, Texas. Virginia rolled to a 4-0 victory over No. 13 Cal (21-6), and Oklahoma edged No. 7 Georgia 4-3. No. 33 Collin Altimirano, a Virginia sophomore from Sacramento, Calif., led No. 31 Andre Goransson 6-4, 2-3 on Court 2 when their match was abandoned. Virginia, which also won the title in 2013, will play in the final for the fifth time in six years. Oklahoma also was the runner-up (to USC) in 2014. The Sooners are coached by John Roddick, the older brother of former world No. 1 Andy Roddick. Nicole Gibbs suffered an agonizing loss and Sam Querrey's Grand Slam struggles continued today in the French Open. Gibbs, a 23-year-old former Stanford All-American from Marina del Rey in the Los Angeles area, lost all five games in the resumption of a suspended match and fell to Heather Watson of Great Britain 5-7, 6-2, 6-2 in Paris. The match between the doubles partners had been halted by rain on Sunday with Gibbs serving at 40-30. After 27 minutes today, it was over. "Obviously disappointed but looking forward to being on the same side of the net as this one later this week," Gibbs tweeted with a photo of her shaking hands with Watson after the loss. Watson, who laced 46 winners to Gibbs' 14, likely secured a spot on the British Olympic team with the victory. Gibbs, meanwhile, fell to 0-3 in the French Open, including a 2014 loss in qualifying. Watson, ranked No. 56, evened her career record against Gibbs, No. 72, at 1-1 and set up a match against 13th-seeded Svetlana Kuznetsova of Russia. Kuznetsova, the 2009 champion, held off Yaroslava Shvedova of Kazakhstan 4-6, 6-1, 6-4. Watson twice came within two points of stunning Serena Williams in the third round at Wimbledon last year before falling 6-2, 4-6, 7-5. Watson led 3-0 (two service breaks) in the third set and served for the match at 5-4, but Williams rallied and went on win her sixth Wimbledon crown. Like Gibbs, the 24-year-old Watson has a Stanford connection. She teamed with Marina Erakovic of New Zealand to win the doubles title in the 2012 Bank of the West Classic on Gibbs' former home courts. Querrey, a 28-year-old San Francisco native living in the Los Angeles suburb of Santa Monica, lost to U.S. wild card Bjorn Fratangelo, the 2011 French Open boys singles champion, 6-3, 6-1, 6-7 (3), 6-3. The 6-foot-6 (1.98-meter) Querrey, ranked No. 37, has won one match in his last six Grand Slam tournaments since reaching the third round of the 2014 U.S. Open. Also, Querrey has lost in the first round of singles in seven of his 10 appearances in the French Open. He advanced to the third round in 2013 for his best result at Roland Garros. Fratangelo, who was named after Bjorn Borg, made his French Open main-draw debut at 22 with a career-high ranking of No. 103. Fratangelo is one of only three Americans in the Open era (since 1968) to win the French Open boys singles title, along with John McEnroe (1977) and Tommy Paul (2015). Fratangelo will play ninth-seeded Richard Gasquet of France. Gasquet dismissed Thomaz Bellucci of Brazil 6-1, 6-3, 6-4. Nicole Gibbs, a former Stanford star from Marina del Rey in the Los Angeles area, led Heather Watson of Great Britain 7-5, 2-6, 2-1 (one service break) on Sunday when rain suspended their first-round match in the French Open in Paris. The match is scheduled to resume today after a 2 a.m. PDT men's singles encounter, although rain is forecast again. Watson, ranked No. 54, faces more pressure in the match than No. 72 Gibbs. Watson, 24, has points to defend after reaching the second round at Roland Garros last year and is trying to qualify for the Olympics. The 23-year-old Gibbs, who seeks her first career French Open victory, has neither of those issues. Watson twice came within two points of stunning Serena Williams in the third round at Wimbledon last year before falling 6-2, 4-6, 7-5. Watson led 3-0 (two service breaks) in the third set and served for the match at 5-4. Williams went on to win the title. Sam Querrey, a 28-year-old San Francisco native living in the Los Angeles suburb of Santa Monica, is scheduled to play U.S. wild card Bjorn Fratangelo, who won the 2011 French Open boys singles title, today in the first round. The 6-foot-6 (1.98-meter) Querrey is ranked No. 37, and Fratangelo is a career-high No. 104. Querrey won the Geneva doubles title last week with fellow Los Angeles-area resident Steve Johnson. The Cal men upset a top-five team for the second consecutive day to reach the NCAA semifinals for the first time in 25 years. The 13th-ranked Bears defeated No. 5 Ohio State 4-2 on Sunday in Tulsa, Okla., after edging No. 4 Texas Christian 4-3 on Saturday. Florian Lakat, ranked 30th, clinched Cal's win over Ohio State by knocking off No. 1 Mikael Torpegaard 6-3, 2-6, 7-6 (6) on Court 1. Lakat, a junior from France, trailed 5-3 in the third set. Cal (21-6), which joined the Bears women in the semis, will face top-ranked Virginia, the defending champion, today at noon PDT. The Cavaliers (28-4) routed No. 9 Florida 4-0. No. 33 Collin Altamirano, a Virginia sophomore from Sacramento, Calif., led No. 53 Alfredo Perez 6-4, 5-4 on Court 2 when the Cavaliers clinched the overall victory and matches were abandoned. No. 7 Georgia and No. 11 Oklahoma will meet in the other semifinal. The Sooners (19-10), the runners-up last year, nipped No. 2 UCLA 4-3 on freshman Andre Biro's victory on Court 6. No. 6 Mackenzie McDonald, a UCLA junior from Piedmont in the San Francisco Bay Area, defeated No. 97 Andrew Harris 3-6, 6-2, 7-5 on Court 1. 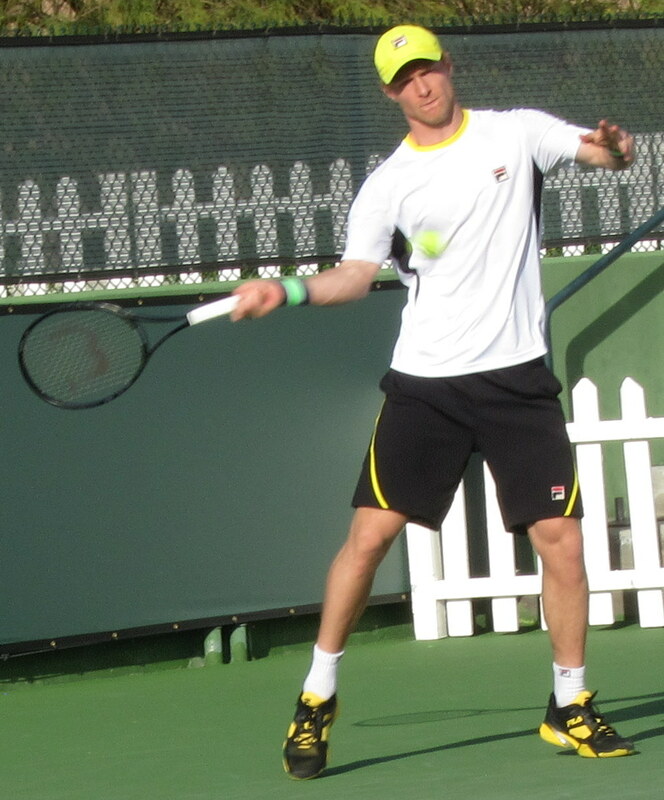 But the Bruins' Logan Staggs, a sophomore from Tracy, Calif., lost to Florin Bragusi 6-4, 7-5 on Court 5. In today's women's semifinals at 8 a.m., No. 2 Cal (23-1) will play No. 12 Oklahoma State (28-4), and No. 15 Stanford (18-5) will take on No. 6 Vanderbilt 23-5), the defending champion. Novak Djokovic (1) -- More dominant than the Harlem Globetrotters. Northern California connection: None. Andy Murray (2) -- Less popular in France than Lance Armstrong after dumping Amelie Mauresmo as coach. NorCal connection: Won first of his 35 tour-level singles titles (fourth among active players) in now-defunct SAP Open in San Jose at 18 in 2006 and repeated in 2007. Also won Aptos Challenger in 2005. Stan Wawrinka (4) -- Hopefully, defending champion won't wear those shorts from the underwear department at JCPenney again. NorCal connection: None. Rafael Nadal (5) -- Nine-time French Open champion hasn't beaten Djokovic since Windows 1. NorCal connection: None. Kei Nishikori (6) -- More popular in Japan than sake. NorCal connection: Lost in second round of SAP Open in all three appearances (2008, 2009, 2011). Brad Gilbert of San Rafael coached Nishikori in 2011. Jo-Wilfried Tsonga (7) -- No Frenchman has won Roland Garros since reign of Louis XIV. NorCal connection: None. Serena Williams (1) -- Only another case of nerves -- or serving of dog food -- will prevent defending champion from tying Steffi Graf with 22 Grand Slam singles titles, second on all-time list behind Margaret Court (24). NorCal connection: Won Bank of the West Classic at Stanford in 2011, 2012 and 2014. Agnieszka Radwanska (2) -- New Horizons space probe, which passed Pluto last July, is closer to Earth than No. 2 Radwanska is to No. 1 Williams in point standings. NorCal connection: Runner-up to Dominika Cibulkova in 2013 Bank of the West Classic. Angelique Kerber (3) -- Did fellow German Graf a solid by stunning Williams in Australian Open final. NorCal connection: Reigning champion in Bank of the West Classic. Garbine Muguruza (4) -- Has more international background than Barack Obama -- born in Venezuela, plays for Spain, lives in Switzerland. NorCal connection: Won doubles title in 2014 Bank of the West Classic with fellow Spaniard Carla Suarez Navarro. Victoria Azarenka (5) -- Graduate of Gael Monfils School of Health and Wellness. NorCal connection: Won Bank of the West Classic in 2010. 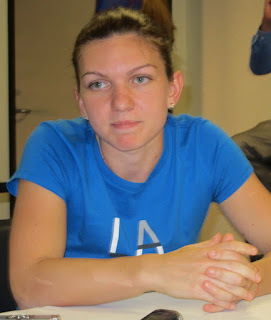 Simona Halep (6) -- French Open runner-up to Maria Sharapova (remember her?) in 2014. NorCal connection: Lost in first round of 2011 Bank of the West Classic in only Stanford appearance. The Stanford women's victories are becoming more improbable each day. Winning 4-3 for the third consecutive match, the No. 15 Cardinal defeated No. 10 Michigan on Saturday in the quarterfinals of the NCAA Championships in Tulsa, Okla.
Taylor Davidson clinched the first two victories on Court 2. This time, No. 67 Caroline Doyle edged No. 68 Kate Fahey 6-2, 2-6, 7-6 (4) on Court 3. No. 2 Cal, meanwhile, defeated No. 8 Pepperdine 4-2 to reach the semifinals for the first time since 2009. Doyle, a junior from San Francisco, snapped a three-match losing streak in singles after trailing 6-5 in the third set and double-faulting four consecutive times at the end of her doubles loss on Court 1. For the fifth time in its last six matches, Stanford triumphed despite losing the doubles point. Each win has come against a top-20 team. The Cardinal (18-5) will face No. 6 Vanderbilt (23-5), the defending champion, on Monday at 10 a.m. PDT. The Commodores beat No. 14 Virginia 4-2. Vanderbilt routed Stanford, playing without 2015 NCAA singles runner-up Carol Zhao, 4-1 in Nashville, Tenn., on Jan. 30. Zhao has since returned to the Cardinal. Stanford has won a record 17 NCAA team titles, most recently in 2013. Florida is second with six. Cal (23-1) will meet No. 12 Oklahoma State on Monday at 10 a.m. The Cowgirls (28-4) knocked off No. 4 Ohio State 4-2. The No. 13 Cal men (20-6) will play No. 5 Ohio State (33-2) today at 10 a.m. in the quarterfinals. ATP World Tour -- Third-seeded Steve Johnson and Sam Querrey, both Los Angeles-area residents, beat top-seeded Raven Klaasen of South Africa and Rajeev Ram of Carmel, Ind., 6-4, 6-1 to win the Geneva Open. Querrey, 28, was born in San Francisco. Dmitry Tursunov, ailing as usual, drew a seed. Sam Querrey will play a former French Open junior champion named after Bjorn Borg. And Nicole Gibbs will face a player who almost beat Serena Williams at Wimbledon last year. The three players with Northern California connections learned their first-round opponents in the French Open when the draw was held Friday. The year's second Grand Slam tournament is scheduled for Sunday through June 5. Tursunov, a 33-year-old Russian who trains in the Sacramento suburb of Granite Bay, will meet 14th-seeded Roberto Bautista-Agut of Spain. Tursunov is 2-0 against Bautista-Agut, including one match on clay, without dropping a set but hasn't played a match since losing in the first round of the Sarasota (Fla.) Challenger on clay in mid-April. "Dmitry is not at 100 percent" Tursunov's manager, Michael Gorin, wrote in an e-mail without elaborating. Tursunov retired from his first-round match in the Australian Open in January with a hip injury while trailing Stan Wawrinka two sets to none. Tursunov also missed the last half of 2014, except the U.S. Open, and the first 9 1/2 months of 2015 with plantar fasciitis in his left foot and pain in his left ankle that was operated on twice in 2009. Ranked as high as No. 20 in 2006, Tursunov has tumbled to No. 484. Querrey, a 28-year-old San Francisco native living in Santa Monica in the Los Angeles area, will play Bjorn Fratangelo, a 22-year-old wild card originally from Pittsburgh, for the first time. Querrey is ranked No. 37 and Fratangelo a career-high No. 104. Fratangelo in 2011 joined John McEnroe (1977) as the only Americans in the Open era (since 1968) to win the French Open boys singles title. Tommy Paul became the third last year. Querrey reached the third round of the 2013 French Open, his best result in nine appearances at Roland Garros. Fratangelo will play in the main draw for the first time. Gibbs, a 23-year-old former Stanford star, will take on Heather Watson, 24, of Great Britain in a matchup of undersized players. Watson twice came within two points of stunning Williams in the third round at Wimbledon last year before falling 6-2, 4-6, 7-5. Watson led 3-0 (two service breaks) in the third set and served for the match at 5-4. Williams went on to win the title. The 72nd-ranked Gibbs is 1-0 against the 54th-ranked Watson, winning 7-5, 6-2 on a hardcourt in the first round at Seoul in 2014. At Roland Garros, however, Gibbs is 0-1 in the main draw, and Watson has reached the second round four times. Watson teamed with Marina Erakovic of New Zealand to win the doubles title in the 2012 Bank of the West Classic on Gibbs' former home courts at Stanford. Andre Goransson won the deciding match as the Cal men upset Texas Christian 4-3 on Friday to reach the NCAA quarterfinals for the first time in 13 years. Goransson outlasted Alex Rybakov 6-4, 3-6, 7-5 on Court 2, giving the No. 13 Bears a 4-3 victory over the No. 4 Horned Frogs in Tulsa, Okla.
Goransson, a junior from Sweden is ranked No. 31. Rybakov, a freshman from Coral Springs, Fla., is No. 24. The Bears (20-6) will play No. 5 Ohio State (33-2) on Sunday. The Buckeyes edged Texas 4-3. In a meeting of Pacific-12 Conference rivals, No. 2 UCLA eliminated No. 29 Stanford 4-2. On Court 1, sixth-ranked Mackenzie McDonald of UCLA and Piedmont in the San Francisco Bay Area routed 15th-ranked Tom Fawcett 6-1, 6-2. The Cardinal, under second-year coach Paul Goldstein, reached the round of 16 for the first time since a quarterfinal appearance in 2012. The Bruins (25-2) will face No. 10 Oklahoma (18-10), last year's runner-up. Top-ranked Virginia, the defending champion, handled No. 16 Oklahoma State 4-2. Collin Altamirano, a sophomore from Sacramento, Calif., ranked 33rd, topped Arjun Kadhe 6-7 (4), 6-3, 6-2 on Court 2 to clinch the overall victory. The Cavaliers (27-4) will play No. 9 Florida (21-6), and No. 3 North Carolina (28-4) will take on No. 7 Georgia (23-4). In today's women's quarterfinals, No. 2 Cal (22-1) will face No. 8 Pepperdine (24-2), and No. 15 Stanford (17-5) will meet No. 10 Michigan (23-6). to compete on four NCAA title teams (1995-98). He hardly needs it, but anytime Paul Goldstein wants additional credibility with his players, friends and acquaintances, he can play the Djoker card. Goldstein -- the men's tennis coach at Stanford, his alma mater -- defeated Novak Djokovic 10 years ago in the first round of the Australian Open. OK, so Djokovic was an obscure 18-year-old at the time. Goldstein, then 29, will take it. "It turned out to be a pretty good win for me, I guess," deadpanned Goldstein, who will turn 40 on Aug. 4. By winning the upcoming French Open, Djokovic of Serbia would become the eighth man to achieve a career Grand Slam in singles and tie Roy Emerson for fourth place all-time with 12 major singles titles. The year's second Grand Slam tournament begins Sunday, Djokovic's 29th birthday. Goldstein's playing credentials pale in comparison, of course, but are impressive nonetheless. He became the first player to compete on four NCAA championship teams (1995-98), a feat also accomplished by USC's Steve Johnson (2009-12). Only 5-foot-10 (1.78 meters) and 158 pounds (72 kilograms), Goldstein played professionally for 11 years. He attained career highs of No. 58 in the world in singles in 2006 and No. 40 in doubles in 2007. For much of his career, Goldstein was the highest-ranked singles player in the world with a college degree (human biology). In addition to Djokovic, Goldstein beat International Tennis Hall of Famer Patrick Rafter, future Hall of Famer Lleyton Hewitt and former top-10 players Greg Rusedski and Alex Corretja. In doubles, Goldstein reached the semifinals of the 2005 U.S. Open with former Stanford teammate Jim Thomas. Although Goldstein never won an ATP singles or doubles title, he captured a then-record 30 championships combined on the minor-league USTA Pro Circuit. Goldstein's 6-2, 1-6, 6-3, 6-2 victory over Djokovic was the first of their three meetings, all within 13 months. Djokovic won 6-3, 6-2, 7-6 (3) in the first round at Wimbledon in 2006 and 6-4, 7-5 in the Adelaide quarterfinals in January 2007. "Even though I beat him the first time, he obviously had a great deal of potential," Goldstein, a Washington, D.C., native who attended high school and college with Chelsea Clinton (although Goldstein is three years older), said recently by telephone. "I don't know that I could say I thought he would be one of the greatest ever to play the game. "The thing that strikes me the most is his level of improvement (in 13 months) was astronomical, more than anyone I had seen, and he's obviously continued that trend. When I played him in January '07, he was a different, much better player than he was a year prior, even six months prior. "His level of improvement specifically related to his movements and the force behind each of his balls. Every ball from both wings was just so huge one year later." Goldstein admitted there were extenuating circumstances in his first match against Djokovic. "The time I did beat him, I thought he was the better tennis player, but it was a three-out-of-five-set match, and it was hot," Goldstein recalled. "At that time, his conditioning wasn't a strength. In fact, you could argue that early in his career it was a bit of a weakness. "The incredible part there is I think I won that match because I was in better shape than him, and he's gone on to be so innovative with respect to his conditioning, his nutrition and his mindfulness. Now he can go six hours with the fittest guys in the world. If he's not the most physical player in the world, he's certainly one of them. That has become a very clear strength." the French Open, which begins on his 29th birthday. It won't be easy. Added Goldstein: "I have so much respect for him. I use him as a model (for Stanford players) -- how to approach the game and focus on process over outcome -- all the time." With four titles in the last five Slams, Djokovic is rapidly gaining on Roger Federer (17), Rafael Nadal and Pete Sampras (14 each). Goldstein hedged when asked where Djokovic, who's still in his prime, will go down among the all-time greats. "That's a difficult question to answer, but I think he's in the conversation," said Goldstein, who never played Federer or Nadal. "That's the ultimate compliment. I think it's important for Novak to get the French to complete the career Grand Slam." Goldstein considers Djokovic the favorite at Roland Garros this year. He has reached the French Open final three times, losing in four sets to Nadal in 2012 and 2014 and to Stan Wawrinka last year. Djokovic "is playing the best tennis right now, and he'll be highly motivated," Goldstein offered. Still, Djokovic faces a big challenge on the slow clay. "I think it's the hardest Slam to win in general," Goldstein asserted, "and it's certainly the hardest for a guy like him. He hits the ball pretty flat on both wings and likes to take the ball early. (On hardcourts), the ball gets through the court and does a little more work for you. "The thing also overlooked on clay is the movement. It's a different strategy than movement on hardcourts. A lot of it is instinctive. He's very comfortable on clay -- don't get me wrong -- but he's probably a little more comfortable on hardcourts." Goldstein, in his second year as the Stanford men's coach, has the Cardinal in the NCAA round of 16 for the first time since a quarterfinal finish in 2012. Stanford will face Pacific-12 Conference rival UCLA, seeded third, today in Tulsa, Okla. The Cardinal players are aware that their coach has beaten Djokovic. "They think it's pretty cool," Goldstein noted. "He's the standard right now."